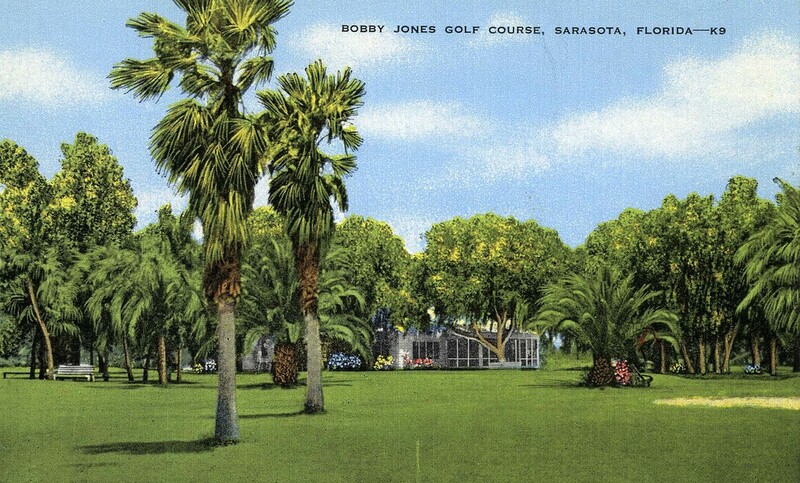 VINTAGE POSTCARD Bobby Jones Golf Club, Sarasota Florida. Friends of Bobby Jones Golf Club embraces the Values of Sustainability and Environmental Stewardship, Gender Respect and Equity, Historic Preservation, Inclusion and Accessibility as core principles guiding each of our "Initiatives in Initiatives." Within and integral to each Initiative is the intent to provide enhanced opportunities for participation and accessibility in golf by players of all abilities and disabilities, including access to all areas of play, and in partnership with organizations dedicated to accessibility for the disabled and, working with our Veterans Committee, for disabled American veterans of military service. Friends of Bobby Jones Golf Club supports Golf: Accessible and Inclusive Networks, Golf Programs for People with Disabilities, and the National Alliance for Accessible Golf, to help increase participation of people with disabilities in the game of golf. According to the 2010 US Census Bureau survey, there are approximately 57 million Americans with some form of disability. This includes 19 percent of the total US population. In other words, almost 1 in 5 U.S. residents has a disability. 10 percent of persons with some disability now play golf. 22 percent of those with disabilities played golf before incurring their disability, but are not playing now. 33 percent felt uncomfortable about playing in front of others. 31 percent believed that the course staff did not know how to assist them. 36 percent said that they needed a better understanding of the fundamentals of golf. 38 percent stated a need for lessons specific to their disability. Friends of Bobby Jones Golf Club supports the Wounded Warrior Project, envisioning a generation of Wounded Warriors well-adjusted in body, receiving the care the need to maximize rehabilitation and live active and healthy lives. Through adaptive sports, health, nutrition and recreational activities, Wounded Warrior Project helps warriors achieve independence and pursue an excellent quality of life. Friends of Bobby Jones Golf Club supports the Adaptive Golf Association, dedicated to providing individuals with physical challenges the needed resources to learn and play the game of golf, and as an advocate for individuals with physical challenges who want to participate in the sport, the AGA's goal is to provide professional instruction and become a resource for individuals to find adaptive equipment and gain access to municipal golf courses. Friends of Bobby Jones Golf Club supports the International Sports Promotion Society, to Inspire Through the Power of Sport, in Aid of Blind and Disabled Golf and promoting Blind and Disabled Golf in the Paralympics. ISPS's support for golf stems from a firm belief in the "power of sport". Sport has a unique ability to create hope, to break down educational and cultural barriers and to inspire people in a way that very little else does. Sport brings people together and unites communities around the world. Nick Stavros, United States Navy (retired), Founding Trustee of Friends of Bobby Jones Golf Club is Chair of our Veterans Committee. Please join! Integral to the Strategic Vision and Master Plan for Bobby Jones Golf Club is the promise that enterprise-wide sustainability and environmental responsibility go hand-in-hand with the long-term economic and social success of both the Club and the City. Friends of Bobby Jones Golf Club promotes and supports integrated planning for sustainability throughout each step of the process, including developing, documenting and demonstrating the highest standards for achievement in sustainability. In the areas of site planning; building planning, design, architecture and engineering; golf course planning, design, engineering and construction; we promote high quality, high performance systems and sustainable best practices through collaborative and educational efforts. Michael Carlson, AIA, LEED Accredited Professional, Founding Trustee of Friends of Bobby Jones Golf Club is Chair of our Sustainability Committee. Please join! We believe that what we build demonstrates our values, with each building comprised of systems that interact with other systems including the larger ecological systems and the human community. We will participate in the planning, design and development of a sustainable, pedestrian-friendly and neighborhoods-friendly property with good connections to the community. An integrative approach to producing buildings that are designed to be efficient and have a lower impact on their environment. Right-sizing of buildings that efficiently perform their functions. Green infrastructure to reduce the environmental consequences of the construction and operation of buildings and infrastructure. Strategies that minimize the impact on ecosystems and water resources. Smarter use of water, inside and out, to reduce potable water consumption. Better building energy performance through innovative strategies. Using sustainable building materials and reducing waste. Better indoor air quality and access to daylight and views. We recommend that new buildings obtain the highest possible certification from the United States Green Building Council’s Leadership and Education in Environmental Design (LEED) rating system, a nationally recognized standard for determining best practices in sustainable design, development and the construction process. While primarily focused on design and construction, LEED also helps lay the foundation for sustainable operations and maintenance practices once the project has been completed. Upfront planning for green operations and maintenance can help ensure that the building performs to its full potential. We advocate the programs of the Florida Green Building Coalition, a nonprofit Florida corporation dedicated to improving the built environment. The FGBC’s mission is "to provide a statewide green building program that defines, promotes, and encourages sustainable efforts with environmental and economic benefits." The FGBC’s vision is that every individual, organization, government and corporation adopt and implement operational values and practices that protect and improve Florida’s natural resources and provide economic opportunities for all. Sustainable Florida advances the vision of sustainability by identifying, supporting and communicating best management practices: those which protect and preserve Florida’s environment while building markets for Florida’s businesses by enhancing their competitive advantages today. We advocate the American Society of Golf Course Architects recommendations for Environmentally and Strategically Sustainable golf course planning, design, construction and operations. We support reducing the amount of regularly maintained turfgrass on the golf courses, including a plan for keeping the strategic intent of the course intact and ensuring appropriate installation of replacement materials. Replacing turfgrass in out-of-play areas with native grasses or plants can be a good way to improve sustainability. Some out-of- play areas can even be non-irrigated and covered with wood mulch or pine straw from low-cost reclaimed tree materials. Lowering maintenance costs, reducing the amount of turfgrass can bring a reduction in labor, equipment, fertilizer and water costs. Energy budgets can also be reduced as less water use results in lower electrical costs. Using less water, reducing regularly maintained turfgrass and replacingit with native grasses or native plants requiring less irrigation can realize signifcant reduction in water usage. Naturalization Becoming more natural as fewer acres of high-maintenance turfgrass are planted and out-of-play areas are converted to non-irrigated natural habitat. Wetlands Naturalized areas on golf courses often include wetlands and other non-turf areas, accounting fora significant acreage of open space land. Technology Innovations for efficient irrigation are being implemented on golf courses. Soil, plant, and weather sensors mean less water is used thanks to these advancements. Water Recycling Golf courses are using recycled water for irrigation. Bio-filtering Turfgrass and open spaces of golf courses are efficient at filtering pollutants in water that runs off our highways, rooftops, and developed areas. Productive Use of Water The U.S. golf economy is estimated at more than $70 billion. Golf returns a direct benefit to the local economy. Turfgrass Science Research funded by golf has yielded new grasses that require less water and are more drought-tolerant. Parks, sports fields and lawns benefit from this research. Drought Ready Golf course architects are planning ahead for flexibility in water use. Capturing stormwater and planting drought tolerant turfgrasses are preparing golf for the future. Water Harvesting Golf courses collect stormwater for irrigation use. New technology can enhance the recharging of ground water reserves. Ultimately, less water from other sources is needed and ground water resources are replenished. Restrict municipal water used for irrigation. Bobby Jones Golf Club exists on the largest open tract of land in the city of Sarasota, larger than all other City parkland combined. The property supporting Bobby Jones Golf Club consists of approximately 315 acres of golf, and of habitat representing near HALF of all designated Parkland in the City of Sarasota. Sustainable practice recognizes that no living being, including human beings, exists in isolation. Ecological thinking means looking at living things in their whole context, while seeking also to understand the interconnections between all living beings and their environment. Everything, including our buildings and our golf courses, is part of one Whole System. Development on and of a golf course is comprised of systems that interact with other systems including the larger ecological systems and the human community. A "whole system" design leverages the complex and complementary interactions to reduce energy use and levy the smallest possible environmental impact, while enhancing occupants' comfort and productivity. Friends of Bobby Jones Golf Club supports the evolution of Bobby Jones Golf Club for certification as a Audubon International Audubon Cooperative Sanctuary - Golf for environmental management best practices. Naturalizing currently manicured areas of the golf course, blending environmentally responsible maintenance practices into day-to-day golf course operations, increases habitat while decreasing the maintenance footprint, allowing budgeted resources to be utilized for maximum effect within the strategic areas of play. We seek to partner with neighborhoods, local government and community organizations in helping to organize waterway restoration throughout the golf course property and its perimeter, providing increased healthy habitat and enhancing water quality on and off the golf course for the benefit of the entire community and ecosystem. Water that runs through Bobby Jones Golf Club makes its way to Phillippi Creek and Roberts Bay estuary system. Outreach and Education for golfers, to inform golf course players, visitors and neighbors of Bobby Jones Golf Club, as well as the local education community, the who, what, where, how and why of environmental programs and projects, including formation of a Resource Advisory Group to help plan and implement projects and educational efforts. The LPGA Tour leader in driving distance, Nicole Smith, averages 275 yards off the tee, and would have also led the PGA Tour as #1 in the first year it recorded this statistic, 1980. Nicole Smith would have been in the PGA Top Ten in driving distance as recently as 1993, at #9, just ahead of Greg Norman, Nick Price and Paul Azinger, and today would be ranked at #176 on the PGA Tour. The average length of LPGA Tour championship courses this season is approximately 6500 yards. The 2015 United States Women's Open was played at 6850 yards. The 2014 US Women's Open Championship at Donald Ross designed Pinehurst No. 2 was played at 6649 yards. The 2015 US Women's Amatuer was played at 6364 yards. The 2015 US Girl's Junior was played at 6020 yards. The 2014 USGA Senior Women's Amateur was played at 6220 yards. The 2014 United State Open Championship at Donald Ross designed Pinehurst No. 2 was played at 7562 yards. The 2015 US Senior Open was played at 6839 yards. The 2015 US Amateur was played at 7216 yards. The 2013 US Junior Amateur was played at 7619 yards! The Bobby Jones Golf Club American Course plays 4308 yards from the Ladies' Tees, 4773 from the Gold, 5422 from the White and 6032 from the Blue. The Bobby Jones Golf Club British Course plays 5352 yards from the Ladies' Tees, 5502 from the Gold, 6263 from the White and 6647 from the Blue. The Azinger Course at Bobby Jones Golf Club, The Gillespie Course at Bobby Jones Golf Club and The Ross Course at Bobby Jones Golf Club will add a new and innovative respect for and response to the modern player of each gender and all ages. Researchers from the University of Florida Center for Governmental Responsibility and the Rutgers University Center for Urban Policy Research provided Florida’s first comprehensive assessment of the economic impact of historic preservation to the state, entitled Economic Impacts of Historic Preservation in Florida, documenting a conservative estimate of $4.2 billion annual benefit. “The aesthetic and quality-of-life benefits of preservation are generally acknowledged; however, doubts are often expressed about the quantifiable economic contribution of preservation. Historic preservation produces a wonderful return for the public money invested and is one of the most efficient ways public funds can be invested. Historic preservation works”, concluded the study. The researchers focused on several key areas relative to historic preservation: Heritage Tourism, Historic Rehabilitation, Assistance Programs and Property Values. “This report provides striking evidence that Florida’s investment in the preservation and protection of historic places and the legacy of the cultures that created them is paying huge dividends." - Former Florida Secretary of State Jim Smith. For tens of thousands of years, human habitation in Florida had been overlaid, but the wave of new residents to the state during the mid and late twentieth century threatened to erase that history in a drive to accommodate the increasing population’s need for houses, highways and businesses. “Explosive growth in population and economic development left much of the physical evidence of our historic heritage in dust and rubble,” according to the Florida Comprehensive Historic Preservation Plan. Heritage Tourism is by far the largest component of the economic impact of historic preservation, but the various elements complement each other to the benefit of all. With more than 71 million visitors in 2000 alone, researchers were able to estimate $3.72 billion in expenditures generated by heritage tourism. Using accepted industry formulas, the researchers estimate that the $3.72 billion in heritage tourism translated into 107,607 Florida jobs, including 51,794 in the retail sector and 30,068 in the services sector. Another component the researchers studied was historical museums, parks and sites. Of the state’s 356 museums, 183 are considered historic. These historic museums welcomed 9.7 million visitors in 2001. Of Florida’s 156 state parks, 46 include sites on the National Register of Historic Places. More than 46 percent of the 18.1 million visitors to Florida state parks in 2001 traveled to a park that is historic or includes some historic or archaeological site within its borders. The researchers determined that historic properties accounted for about 6.5 percent, or $350 million, of the $5.3 billion rehabilitation construction business in Florida. State officials estimate that 60 to 70 percent of the cost of the typical historic rehabilitation project in Florida is expended on labor, and that usually benefits local labor. The researchers employed an innovative approach to determine whether buildings in historic districts held or appreciated in value compared to comparable buildings outside the district. Working with Geographic Information Systems researchers from the College of Design, Construction and Planning’s GeoPlan Center, the study assessed values for some 28,000 primarily single-family residential properties representing 18 historic districts and 25 comparison neighborhoods in eight Florida cities. In at least 15 of the 18 cases studied, property in the historic district appreciated greater than in non-historic comparison neighborhoods. No instance was found where historic designation depressed property values. Historic preservation AND economic development proponents argue alike that revitalization through rehabilitation and preservation reflects a positive image of a community, creates job opportunities, attracts new industry and strengthens service and retail job markets, stabilizes and improves the area’s tax base and protects the investment already made in infrastructure, while preserving historic resources. The researchers say policy makers need this data on preservation to help make informed decisions about support for historic preservation programs. Sarasota saw the first golf in Florida when Sarasotan Scot John Hamilton Gillespie built his own course beginning in 1886. 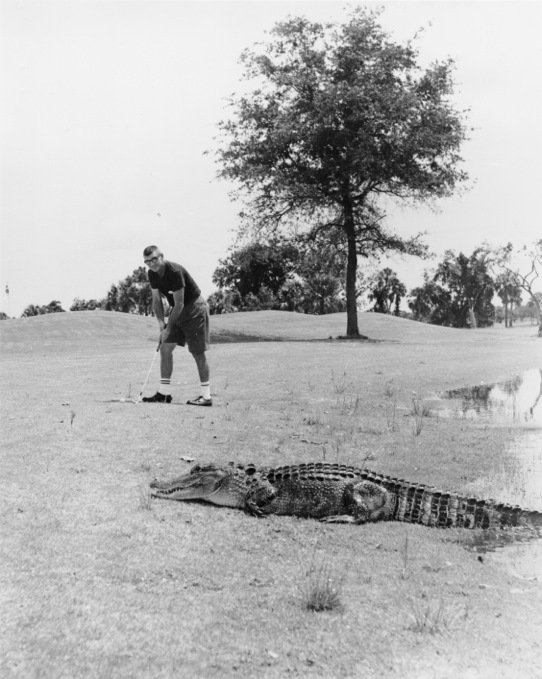 Now Florida is the nation's leader in number of golf courses, and it all began right here. Two years after the death of Gillespie while playing on his own golf course, Bobby Jones Golf Club opened as one of the early classic golf courses of Florida. Today, the historic Donald Ross designed Bobby Jones Golf Club is represented on the Florida Historic Golf Trail, a list of sixty three of the courses that made Florida's early reputation as the place to play in the sun. The Classic Era in golf is generally referred to as the time between the end of World War I and the beginning of the Great Depression, along with the preceding and continuing works of Classic Era golf architects in the years immediately prior to and just after that period. The era is bookmarked historically by the necessary national focus on international conflict in wartime and on the secession of Depression-era investment that included golf courses, and so represents a golden and relatively carefree time also associated with the Jazz Age and Roaring Twenties. The Classic golf architects leading names begin with the first great golf architect, the Canadian-born Scot and 2007 World Golf Hall of Fame inductee, Charles Blair Macdonald (1855-1939), who also coined the term "golf architect" in about 1910. Educated at St. Andrews University in Scotland, C. B. Macdonald was also the winner of the first United States Amateur Championship in 1895 at Newport County Club. His trilogy of truly great golf courses consist of National Golf Links of America (1911) in Southampton, NY, Chicago Golf Club (1894) and The Course at Yale (1926). Macdonald's legacy includes his book, "Scotland's Gift: Golf" as well as the work of his great protégé and collabrator, Seth Raynor. Macdonald is referred to as the "Father of American Golf Architecture". 2005 World Golf Hall of Fame inductee Dr. Alister MacKenzie (1870-1934) was born in Yorkshire, England and Cambridge-educated as a surgeon. His father was of the Scottish Highlands, where the family summered and where MacKenzie drew upon his Scottish roots. MacKenzie was a golfer, active in several clubs in and around Leeds, where he was exposed to the great English golf architect Harry Colt. Serving as civilian doctor during the Boer War he became an expert in the military use of camouflage, a science he applied to the design of golf courses. Designer of golf courses on four continents, MacKenzie's iconic legacy in America includes Cypress Point Club (1928) in Pebble Beach, CA; Augusta National Golf Club (1932) designed with Bobby Jones; and another five Top 100 rated classic courses. Philadelphia-born Albert Warren "Tillie" Tillinghast (1874-1942) was the first great American-born golf architect, and one of the most prolific, credited with 265 course designs. The son of a rubber goods company owner, he was a golfer, playing in the 1906 and 1910 United States Open and in the United States Amateur eight times between 1902 and 1912. A. W. Tillinghast's greatest courses are synonymous with major championships, among them Baltusrol Golf Club (1922), Springfield, NJ; Bethpage State Park (1935); Newport Country Club (1924 renovations following Donald Ross's 1915 work); San Francisco Golf Club (1915); Winged Foot Golf Club (1923), Mamaroneck, NY. Tillinghast's work is listed in GolfWeek's 100 Best Classic Courses thirteen times. Then came 1977 World Golf Hall of Fame inductee Donald James Ross (1872-1948). Born in Dornoch, Scotland and apprenticed under Old Tom Morris at St. Andrews, Donald Ross was golf professional at Dornoch Golf Club (now Royal Dornoch), and competed in the United States Open eight times between 1897 and 1910, finishing in the Top Ten four times. In The Open Championship of 1897 he missed the cut, and did not compete again until his return to The Old Course at St. Andrews in 1910, placing in a tie for eighth place. Emigrating to the United States in 1899 and established as winter golf professional at Pinehurst Resort in 1900, Donald Ross embarked on a full-time design career that brought him and his courses well-deserved fame. At Pinehurst, Donald Ross created No. 1, No. 2 and No. 3. courses, with his beloved Pinehurst No. 2 consistently rated among the nation's finest and host to three United States Open Championships, the Ryder Cup, the PGA Championship, the U.S. Women's Open, the U.S. Amateur, the U.S. Senior Open, the USGA Women's Amateur, the Tour Championship, the World Open, the World Golf Hall of Fame Classic and many more amateur and professional tournaments, with the venue providing the prestige. Donald Ross venues have hosted more than 100 major championship tournaments and his name remains remarkably relevant in championship competition, including the 2013 PGA Championship and the upcoming 2014 U.S. Open, 2014 U.S. Women's Open and 2016 U.S. Senior Open. Other great Donald Ross designed golf courses include Seminole Golf Club (1929) North Palm Beach, FL; Oakland Hills Country Club (1918), Rochester, MI; Plainfield Country Club (1921), Plainfield, NJ; Wannamoisett Country Club (1916), Rumford, RI; Newport Country Club (1915), Newport, RI; Scioto Country Club (1916), Columbus, OH; Inverness Club (1919), Toledo, OH; Interlachen Country Club (1919), Edina, MN; Oak Hill Country Club (1924), Pittsford, NY; Aronomink Golf Club (1928), Newtown Square, PA; among an astonishing 28 of the GolfWeek 100 Best Classic Courses. Just these four great golf architects: Macdonald, MacKenzie, Tillinghast and Ross, designed more than half of the 100 Best Classic Golf Courses, an indication of the great value in small and so very rare assembly of talent of historic proportion. Donald Ross designed the golf courses where both young prodigies Bobby Jones (East Lake, 1915, Atlanta, GA) and Jack Nicklaus (Scioto, 1916, Columbus, OH) learned the game. Countless champions honed their games on Donald Ross designed golf courses, including Paul Azinger at Bobby Jones Golf Club. No other golf club in Sarasota County offers public access to a golf course designed by Donald Ross. In fact, no other golf club within an hour's drive of Bobby Jones Golf Club offers public access to a golf course designed by any of the golf architects among the 100 Best Classic Courses. Florida now hosts over 1400 golf courses. In the 2014 PGA Tour schedule, no fewer than seven tournaments will be contested on Florida links. On the 2013 Champions Tour, three Florida courses hosted tournaments, while the Web.com Tour's year-ending Tour Championship was played in Florida. In the LPGA, their season-ending tournament was contested in Florida, while the LPGA's Symetra Tour scheduled Florida tournaments five times. Florida is as central to the world of recreational and competitive golf as ever. And look at the list of venues for golf's major events. As the Major Championships again and again turn to classic courses, the enduring value of a classic course cannot be denied. Bobby Jones Golf Club's historic 1925 Donald Ross designed classic golf course is Sarasota's gem. Friends of Bobby Jones Golf Club supports the restoration and historic preservation of the classic 1925 Donald Ross Course at Bobby Jones Golf Club, in accordance with the restoration guidelines of the Donald Ross Society.